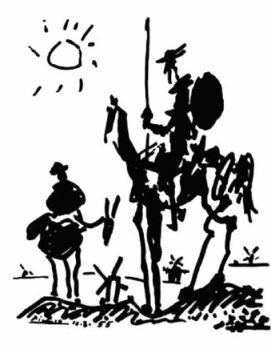 I've always liked this Picasso sketch of Don Quixote and his sidekick, trotting through fields with windmills in the distance. There's something otherworldly about it that, in a few strokes, captures insanity, loneliness, friendship, struggle... all in one image. But mostly insanity, given the actual story of Don Quixote. 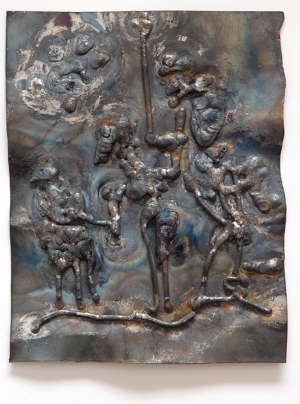 It's a welded relief sculpture, which ends up being a work of art (mine), based on a work of art (Picasso's), based on a work of art (Cervantes'). This is an example of multi-tiered inspiration. It's awesome! I tell you, you are an artist, genius one! That came out really cool. I like it cause it's different from your usual. But then again didn't you weld this one too? Yup - This was one was welded, too. Only instead of welding two things together, I actually used the welding process to build up the image. It's quite a bit different from the way I typically make my figurines.